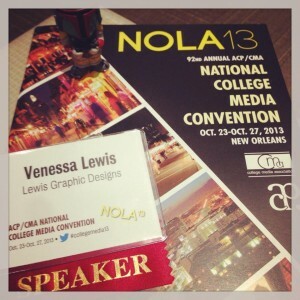 Venessa Lewis of Lewis Graphic Design had the honor of speaking at the National College Media Convention held this past weekend in New Orleans, LA. The Fall National College Media Convention is presented by Associated Collegiate Press and College Media Association. More than 2,300 student journalists and advisers are expected to attended the 360+ educational sessions, keynotes, workshops, critiques, trade show and awards ceremonies. Lewis presented the session “Elements of Great Ad Design,” in which she discussed great ad design and considerations for balancing customer input and successful design principles. She also provided critique for student portfolios after the session.